The African Methodist Episcopal Church was started in 1787 in Philadelphia, Pennsylvania, by a group of disinherited Americans whose forefathers came from Africa. The leader of this group was a 27 year-old “African,” Richard Allen. At that time the word” African” was used to designate those persons whom we now call American Negroes or colored people. The movement to organize a church separated from the white people’s church was started in response to the “Africans” need for opportunities for self-expression and fuller involvement in the service of the worship of God, and in society as a whole. It was the answer to cry for social recognition as human beings, and the means through which a group of people started on a program which gave them a growing sense of dignity and self -respect. To foster this program Richard Allen considered it important to conduct night school classes in which his people could learn how to help themselves. Out of these night school classes has come the church’s philosophy of education with its strong emphasis upon se1f-help. The general emphasis has not been significantly changed until this day. In addition to the educational program of the local church, the A. M. E. Church operates eleven institutions of higher education. Most religious groups have their origin in some theological, doctrinal, or ideological dispute or concern. But the A. M. E. Church coordinated as a protest against the inhuman treatment which the helpless people of African descent were forced to accept from the white people belonging to the St. George M. E. Church in Philadelphia. Pennsylvania. This fact says to us that the organization of A. M. E. Church was the result of racial discrimination rather than of any theological or doctrinal concern. The A. M. E. Church is a member of the family of Methodist churches. Its founder, and first active bishop, Richard Allen, felt that no religious sect or denomination would suit the capacity of his people as well as did Methodism with it’s emphasis upon the plain and simple gospel which the unlearned could understand, and it’s orderly system of rules and regulations which the undeveloped needed. He felt that Methodism had what the “Africans” needed to encourage him to make progress, to worship God freely, and to fill every office for which he had the capability. The “Africans” who started the A. M. E. Church were very poor and most of them could not read nor write. Yet, under the leadership of Richard Allen they manage to buy an old blacksmith shop, and to move it to a lot at the corner of Sixth and Lombard Streets in Philadelphia, Pennsylvania, where they organized Bethel A. M. E. Church which stands today as one of the historic shrines of Philadelphia. In time, other “African” churches were started in Charleston, Baltimore, Maryland; Salem, New Jersey; Attleboro, Pennsylvania; Wilmington, Delaware and other places in the United States. In the year 1816 these churches came together and formed the A. M. E. Church. Today the A. M. E. Church has 21 active bishops and more than a million members scattered throughout 50 States in the U.S.A., the Dominion of Canada, South America, West Africa, and the West Indies. Rev. Sterrett – This church was born, not only as a child of necessity, but also of a child of tribulation. The necessity was caused by the mother church (Emanuel) being over-crowded. She had forty two hundred (4200) members and eight hundred (800) probationers, making a total of five thousand(5000). Emanuel’s old building had become very much dilapidated and there were a portion of the members who favored the old building, and another portion who favored building a new church on another spot. But those who had been the founders of Emanuel church would not adhere to leaving that sacred spot. After calling many meetings, and finding it was impossible to harmonize the two faction, I offered the proposition that all unite and remodel the present structure, and then all unite and purchase another lot and build another church. This proposition was unanimously adopted, and so well please were they with the remodeling of the church that the faction who desire to stay very readily united with the others in purchasing a lot to build. Providence seemed to favor us, for it was not long before two lot were advertised for sale on the South East comer of Rutledge Avenue and Montague Street. Seeing that these two lots would give us ample room for our church building, we secured a real estate in for us incognito. The day of the sale came, and the lots were knocked to our agent for $2,100.00, $700.00 to be placed immediately in the bank as good faith money. Not one dollar did we have. We succeeded in borrowing the amount, and the money was in the bank on time. We then appointed a building committee consisting of William D. Wilkinson, Joseph F. Russell, George Simpson, and John Alston. As soon as it was publicly known that the A.M.E. had bought the above lot, they became an eyesore to the aristocratic residence of that vacinity. 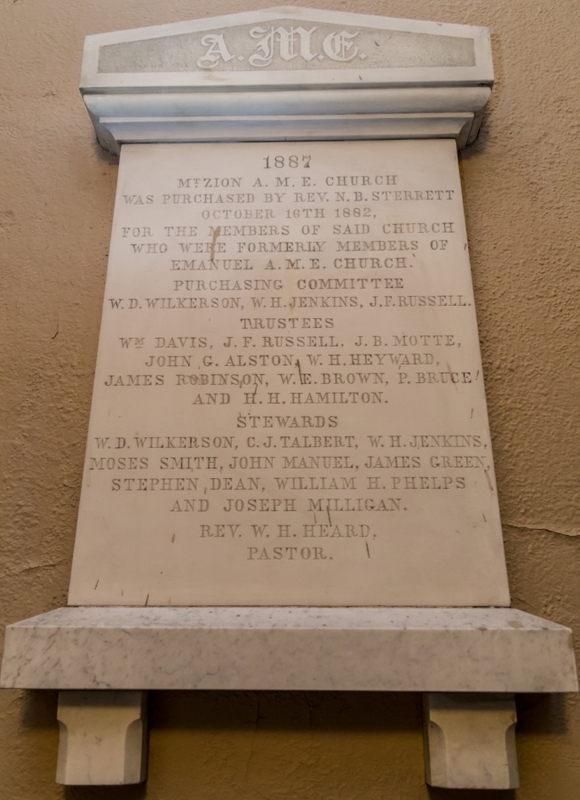 About this time the congregation of Zion Presbyterian Church on Glebe Street, and the congregation of Westminster Presbyterian Church on Meeting Street had become so small that they agreed to amalgamate and sell one of the above churches. But it became a great question as to which church to be sold. The Zion congregation wanted to hold their building, and the Westminster congregation likewise wanted to hold theirs. They finally agreed to put a private price on each church, and then put them both up at auction, with the understanding that the church which got the nearest offer to it’s private price should be sold. to be laboring under these most comfortable circumstances. Having a whole night and day to meditate upon it, without anyone to consult with or tell where they might come and look for me should I not return, it seemed almost unbearable. However the fatal hour came, I habilitated with some of the paraphernalia of a soldier (take out the gun) and went forward. I fasted my horse at the designated. distance, walked to the door of a great mansion, and as I had been instructed, not to ring the bell but to rap. I gave a slight rap, and almost immediately the door was opened by the gentleman himself who ordered me in. After which, the door was shut and locked., I would have preferred standing, but the gentleman bade me to be seated. The first words he spoke sent a chill through me. Rev. Sterrett – ‘O yes, “we are making every preparation. Rev. Sterrett – (These words gave back my aquanimity which I had been without for twenty four hours.) If we had known of any church we could have bought before we took those lots on our hand we might have bought it if it suited us. White man – I want your sacred promise that you would not divulge my name and what I am going to tell you. White man – There are two churches to be sold and private prices have been placed on both. I am a member of the Westminster church and do not want it sold. If you all would put in a bid of $15,000.00, agreeing to pay $6,000.00 cash and $ 1,000. 00 in annual installments, you would get the church. White man – We will take the lot, pay you back the $700.00 with a bonus of $500.00 which amount I could easily raise from the people of this neighborhood to get rid of you. Rev. Sterrett – That sound favorable. White man – “Now, “if the Zion church members get the inkling that colored people are going to buy their church you will never get. “You must get some white man whom you can trust, to act as agent for you. Rev. Sterrett – I have just the man. White man – you must not go about the church, for it might raise suspicion. Rev. Sterrett – Alright. (but it was not alright that time with me, for I could not bear the idea of buying a building without seeing inside of it. The next day I saw Mr. J. L. Moses, who was a real estate agent on Broad Street, and with whom I had contracted much business. After giving him all the plans and he charging me not to be seen on Broad Street the day of the sale, I then set about studying a plan to see inside of Glebe Street Church; for I was determine to see the inside. I found out that Dr. Judkin held one service at five in the afternoon, this played in my hand, and I concluded to worship with him the following Sabbath. Sabbath came, and at the appointed hour I took my seat near the door. Little did anyone think I was an ecclesiastical spy in the church. After services, several of the business men, with whom I had transacted business, expressed a pleasure of seeing me there. In a jocular manner I told them I had heard so much about their pastor thatI came to learn how to preach. This had the very effect I wanted it to have, and they took me to the altar and introduced me to their pastor, telling him what I said. After complimenting him on his sermon (which I suppose must have been a very fine one, but to tell the truth my ears were going with my eyes the whole time he was preaching; and my eyes were taking in the church), I remarked to the pastor what a beautiful edifice it was. He then told me to come and see the lecture room – again just what I wanted. He informed me that the lecture room and vestry were built sometime after the church was built, and that it cost $9,000.00. I was not so particular about that information, and yet it did me good. I felt a thrill of joy pass through me, for I concluded that if the lecture room cost $9,000.00 then the main building must be worth at least $6,000.00, and that I was getting a bargain at $15,000.00 for both. I knew if there was the slightest defect, mistakes, or room for just complaints, I would have to bear the abuse, and curses from both laity and clergy during my life, and perhaps they could be heaped upon my grave after I was dead. If I could have called around me those five true, trusty, and faithful men who had been elected as a building committee and consulted with them my burden would not have been so heavy. But no, I dare not do this, not that I was afraid to trust them, not that I was afraid that they would not be in harmony with me, but I was afraid that they might unintentionally, yes, unconsciously, by word, or act, say or do something that would betray us. The eventful day came, the two churches were put up at auction. No bid was offered for the Westminster church. Fifteen thousand was offered for the Zion Presbyterian Church, and it was knocked down to J. L. Moses, Agent, $6,000.00 to be paid within four months. $1,500.00 of that amount was to be placed in the bank before twelve o’clock the next day as a guarantee that the other $4,500.00 would be forth coming at the expiration of the four months, at which time we were to take possession; but a failure to pay the $4,500.00 within the given time would cause us to lose the $1,500.00 in the bank, and the bargain cancelled. Not a dollar in hand, and I could not say a word to the Building Committee yet, for the contract was not completed until the $ 1,500.00 was in the bank, and it had to be there by the next day at 12 o’clock. You talk about Czars, but that was one time I was compelled to be an ecclesiastic Czar. I got the $700.00 from the lot, and the $500.00 bonus and borrowed $300.00, and had it in the bank before high twelve the next day. I do not tell you that I slept much in those days. The most amusing thing to me in the whole matter was, on e of the Building Committee coming to me the night after the sale and telling me that the Germans had bought the Glebe Street Church. I asked him what they paid for it, and he said he did not know, but they must have paid a very big price for that church. I called my Building Committee together the next day after I had paid the money and told them what I had done. The delight and appreciation with which they received the news more than recompensed me for all I had undergone. Bro. Hunt – You are just throwing away time. and that the doors would be open Monday from 12:00 to 1:00 O’clock for inspection. Monday thepeople came from every denomination, until the church was crowded. This was the first brick church in Charleston owned by colored people, and I speak advisedly. We then organized four regiments of “Willing Workers” (tell all of the Willing Workers to stand, Mt. Zion and Emanuel, ask them to sit.) and belted the city, having them report once a month. How we got the money and where it came from God only knows, but we paid the amount when due, for the people had a mind to work. Now comes the tribulations of which I spoke of in the first page. This lot upon which the church stands was originally Glebe land, and presumably bequeathed to St. Michael and St. Phillips Episcopal Churches. In the division of the land between St. Michael and St. Phillips Churches, this lot was assigned to St. Phillips Church in 1797. On the 1st day of may, 1847, St. Phillips leased this lot to Caldwell and others for 90 years, with a right of perpetual renewal. Caldwell and others, sometime in 1847, assigned this lease to the Glebe Street Presbyterian Church, and the Glebe Street Congregation built this church on the lot some time in 1847. May 16, 1856, St. Phillips Church conveyed this lot in fee simple to the Glebe Street Presbyterian Church. On the 10th day of May 1866, the Glebe Street Church sold this lot and church to the Zion Presbyterian Church of Charleston. These two churches, viz., Glebe Street Presbyterian and the Zion Presbyterian Church of Charleston, amalgamated. We were not by any means surprise, for we had gotten and inkling that we were buying a law suit and used the precautions to bind the Zion Presbyterian corporation to protect us against all lawsuits; and if we lost the church they were to pay us all moneys paid out, and $3,000.00 damages. So we felt perfectly at ease, knowing that if we lost we would be $3,000.00 better than when we commence. Buist and Buist, Rutledge and Young, and Judge Magrah were employed by The Zion Presbyterian Church, and Miles and McCray were employed by St. Phillips. But, O my! the Tobiahs and Sanballats, both among the discontented members and the jealous ministers, they started war on us; told people that we has squandered their money and that they would never get a good title, etc., etc. On October the 16th, I met Mr. Enslow and another officer of the church here, and they handed me the keys, and formally turned the church over. The church was to be dedicated the following Sunday, but they insisted that I should come in before. At that time I did not know the reason, and called a meeting for Thursday night, October 19th, and had a crowded house. 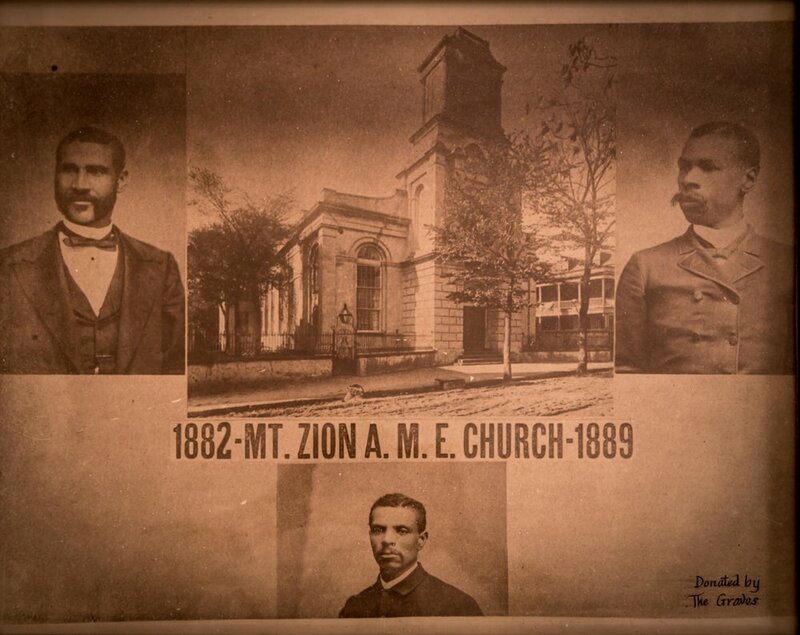 I preached from the text, “We have come to Zion.” I was the first colored man that ever preached in that church. The congregation gave me the privilege of naming the church, and as it was called Zion, I put “Mount” to it. This seemed to please all hands. On Saturday, St. Phillips got out an injunction to keep us from entering, but too late; we were in. If we had not gotten in the church Thursday night we would have been barred from the church for two years, during the litigation. The church gained the suit in both the lower and Supreme Courts, which makes the title of this church the best title in the city of Charleston. On the following Sunday, October 22, 1882, the church was dedicated by Bishop J. M. Brown and William F. Dickerson. The main audience room and lecture room were crowded to overflowing. Among the visitors were Judge Magrah, Mayor Courtney, and many other distinguished white citizens. Joseph F. Russell, in a very unique speech, delivered the keys. the public offering for that day was $720.00. I went away from here. leaving a debt of $8,000.00 on the church. How long, and how many ministers it took to pay that debt, it is for you to say. Thus I have endeavored to give you a sketch ofthe history of Mt. Zion church. Peace be within thy wall, and prosperity within thy palaces. If I forget thee, O Mt. Zion, let my right hand forget her cunning; if I do not remember thee, let my tongue cleave to the roof of my mouth; if I prefer not Zion above my chief joy.